I’m from Long Island, but the nice part (Suffolk County is God’s Country), and because of this, I’ve lived nearly my entire life in the shadow of the World Wrestling Federation. Which is probably why, when I was growing up, the only thing I H-A-T-E-D more than WCW was J-E-Double F J-A-Double R-E-Double T. With that look and ridiculous (glowing!) outfit — he had as much chance as a garbageman of getting over with me. This was back when I saw the South as a monolithic nether region of America, as opposed to a place where a diverse group of people who sometimes hold values different than mine lived, so when this obnoxious hick invaded telling me he was the best performer in the company, spelling his name out and making me listen to his terrible country songs with that god-awful accent, it filled me with a feeling that I was completely unfamiliar with. I actually hated a wrestler. Part of this was the (somewhat lamentable) prejudice, but it was also that he was CONSTANTLY getting over on my favorite wrestlers. When he brought in the Roadie, and they beat Razor Ramon at the Royal Rumble because of a cheap shot chop block — which I had to read about because my family was too poor at the time to buy the PPV — I was as angry as I have ever been about anything in wrestling. I felt what would properly be described as an “X-Pac” level of heat towards him, as I was completely unable to separate my distaste for from his performance. So, when he left — randomly, as he is wont to do — for WCW (which I was only watching with a passing interest between commercial breaks on RAW), I wasn’t just happy: I was complacent. That may seem redundant, or — as I am wont to do — an unnecessary semantic parsing, but it was how I felt. I was content, fundamentally indifferent to his absence, mostly happy about my favorites being given the screentime he was “taking away” from them. When he came back, working that ridiculous quasi-NWA invasion gimmick with his equally annoying — and equally Southern — counterpart James E. Cornette, the anger I felt having him back in town was enough to get me to stop watching the WWF, moving away from the product steadily before essentially completely giving up on it after WrestleMania XV in the spring of 1999. It wasn’t until college that I began watching again (something I covered during #MickFoleyWeek) and it was during this time that Kurt Angle — still the most talented in-ring competitor I’ve ever seen — made his way to TNA, a place I had only very quietly heard of during my attempt to find out every single possible thing about wrestling during my not-so-brief hiatus. But, when I arrived in front of TNA — almost exclusively to watch Angle — that I was confronted by my old arch-nemesis: J-E-Double F J-A-Double R-E-Double T, the man “in charge” of T-N-A. I was furious, that after all these years, after I finally got back “in the game”, that my least favorite wrestler of all time, the man that helped drive me out of the viewing audience, was now ruining the one thing I truly loved about wrestling — Kurt Angle. But much in the same way that watching Mick Foley work his masterpiece with Triple H at MSG, watching Jeff now didn’t just change the way I thought about him, but how I thought about wrestling and art itself. Gone were the days of the over-the-top outfits and stuck-in-the-worst-part-of-the-80s haircut and while his omnipresent guitar still had sparklers coming out of it, the bells and whistles spoke to a person who wasn’t intent telling us how great he was and hoping we believed him, but someone would was great and was ready to show the world what he could do when given the chance. Wrestling is a show, and Jeff Jarrett is one of its greatest showmen. 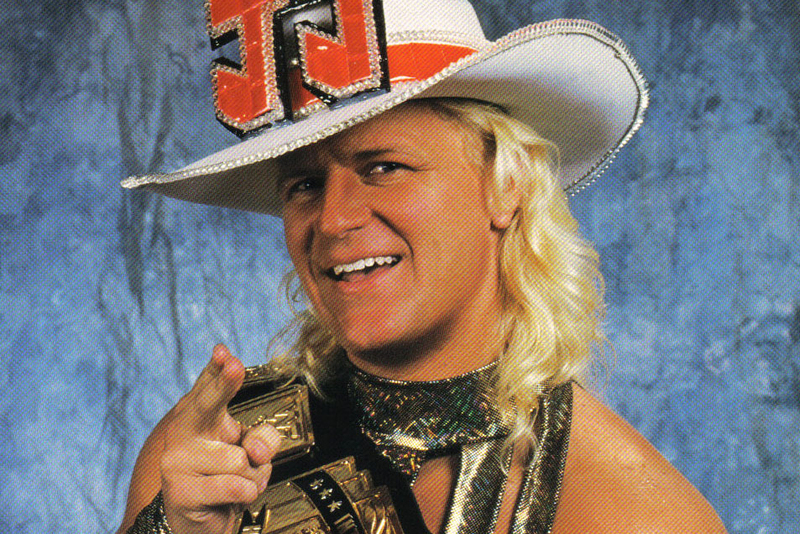 The reason that Jeff Jarrett had a country album, and the reason he brought around a guitar that would inevitably be broken over someone’s head wasn’t because he couldn’t go toe-to-toe with someone like Razor Ramon or Shawn Michaels or even the great Kurt Angle, but because the most entertaining way from him to do it included those things. He wasn’t using them as a crutch, but as a performance enhancer. I thought back to all the times I was infuriated by something he had said in a promo, or how over the Roadie was for me when I was told that he had sung the song Jarrett claimed to have made himself. And I thought about how angry I was that I hadn’t been able to see my guy, Razor Ramon, when he lost to him, how angry I was that I couldn’t be there for him, to cheer for him as he was getting screwed over. And that’s when I realized that, above all else, Jeff Jarrett made me care about the people I was watching, and the things that were happening to them.